So in the “About” section of the blog, I mentioned my fiance. Well, I am happy and proud to announce that he is no longer my fiance, but my husband. Last weekend, on September 5th, Rob and I got married in Mystic, CT (yes, right down the street from where Mystic Pizza was filmed). It was beautiful! We almost had an unexpected guest, Earl. Big, wet, and steamy, Earl almost crashed our wedding with its torrential rains and strong winds. But, to our pleasure, Earl did not stay long, did not hinder many traveling plans, and left the day for our wedding beautiful and early fall-like. I must say that this wedding never would have happened if it weren’t for my parents and their attention to detail, magnificent planning, and of course, their love. My Mom and Dad planned our day to a T – a million times better than anything I could have envisioned – and it was hands down the most fun, beautiful wedding I have ever attended (knowing of course, I am biased, it still was completely amazing). We danced all night to great music, and everyone was so happy and enjoyed themselves immensely. Thank you so much, Mom and Dad, for creating a day for Rob and I to remember and cherish forever. You rock! What also rocked, was the food. OMG YUM. Back during the planning, oh, maybe 8 or 9 months ago, Rob and I created the menu (well, I created it, and Rob said, “That sounds good!”). Knowing our families, we did not stick with the traditional chicken, meat, or fish options, but created 4 courses, flowing together perfectly with taste, presentation, and season. 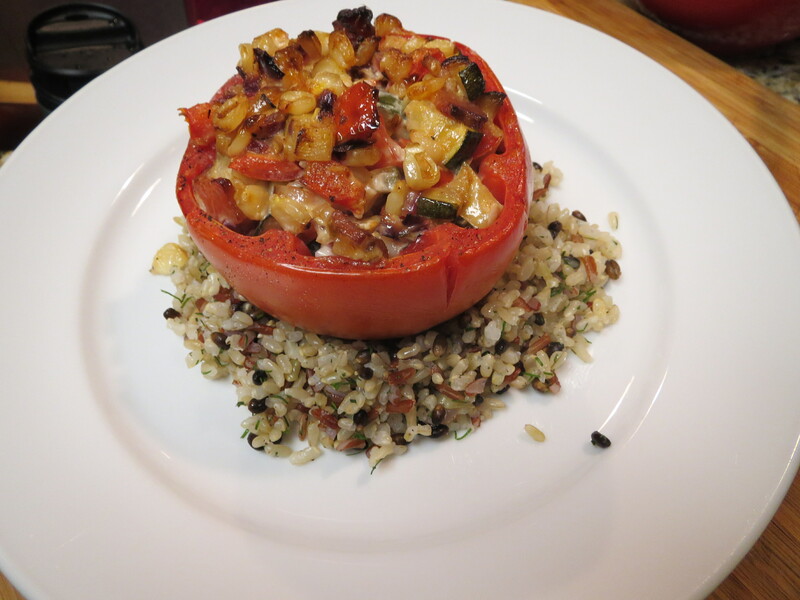 Here’s where I need to give HUGE props to the Marriott – they cooked the envisioned meal, and did it so well. Anyone can say I would love to eat [insert great food item here], and have [said] great food item served to them by someone that doesn’t know how to cook. Bummer. But the Marriott staff can cook. And present. The Menu: Butternut squash soup with pistachios and melted gorgonzola on a lavash cracker. Then a fresh spinach salad with raspberries, blue cheese, currants, and pecans. The entree: An oh-so-perfectly cooked filet mignon on top of a merlot reduction sauce, served with a creamy layered potato gratin, and roasted harvest summer veg. The cake: Chocolate raspberry, with the Marriott’s added touch of a chocolate covered strawberry. The wines were house reds and whites, where the grapes are gathered from various Napa and Sonoma wineries, creating an easy to drink wine that didn’t overpower the palette. I’ll say it again: OMG YUM. Well, Rob and I, of course had a fantastic time, made a point to enjoy the food (I was NOT going to be the bride who didn’t get to eat! ), but then it was back to work for the both of us. No honeymoon yet, but Bora Bora is calling our name next summer (and yes, we had this idea before the Bachelorette splattered the vacation destination all over her heart wrenching, tear stained, rose-giving finale). Anywho, back to work. Boohoo. Reality. So last night – TGIF – we decided to make our own little celebration of marriage with a romantic dinner for two, perfectly accompanied by our gorgeous crystal wine flutes and reception centerpiece place mats. Sole Meuniere. Classic French technique and tastes at it’s finest. Listen hard – you might be able to hear the popping of the brown butter and smell the tart lemon. I won’t lie, I was a tad nervous. As many cooks, I am a bit Type A (surprised? ), and a perfectionist to boot (shocked? 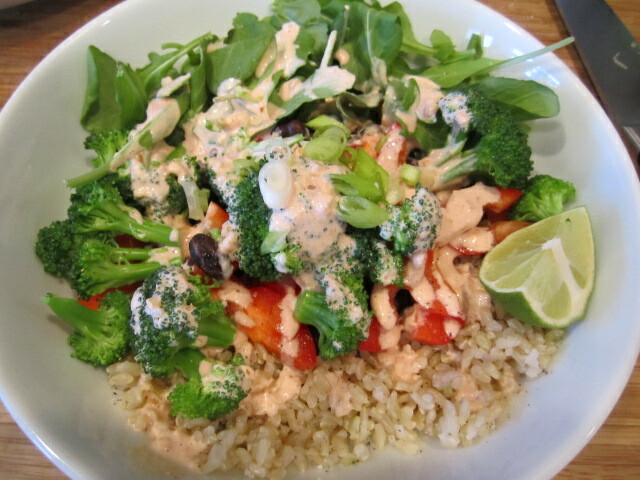 ), and I wanted the dish to be magnificent. This wasn’t a last minute idea – I had done my research. Weeks ago, I went to the small fish shops in the area, trying to find the best place to buy Dover Sole, only to find that as it was not a local fish, it’s totally based on when shops get shipments. Hmm. Alright then. So I’m driving around southern coastal Oregon looking for this delicate fish, finding nothing, and realizing I’m going to have to drive 2 hours to the nearest Trader Joes to get their frozen pre-packaged kind. SIDE NOTE: I’m not complaining here… I love love love Trader Joes and their frozen pre-packaged Dover Sole is great, especially for 1) the price, and 2) the availability. END SIDE NOTE. Then, a day before we leave for the wedding, I go to Chucks Seafood. Chucks is fantastic and smells of salty cucumbers and the ocean, and the people working there wear waders. About to purchase my usual freshly caught Chinook salmon, I look over and see a heaping pile of long thin filets of Dover Sole. $4.99 a pound. Freaking jackpot baby! Fast forward to last night: I take the windy, sans cell phone service road to Chucks after work, pick up 5 filets, and plan the night. The table was set, the side dish was done, and having already sipped a bit of champagne, double checked one of many French cookbooks to have the technique down pat, I got started. You must respect the Dover Sole – it is so delicate, yet surprisingly resilient to the dredging. A bit of s&p in my flour, I had my assembly line all set up, 3 tablespoons of butter starting to melt in the hot pan, and my lemons standing by. Gently lying the fish into the pan and hearing the butter sizzle was so satisfying, and then the flip, and then the squeeze of lemon – standing back of course – watching the brown bits forming and the chemical reaction to the lemon and butter creating a delicate foam was the clue to give the fish a few pan bastings, onto the plate and drizzled with the pan sauce in two quick movements, the meal was completed as quickly as it started. We “yummed” and “oohed” and drank the champagne, and ate the side dish (wild rice with pistachios and scallions), and had a fabulous night. As a newly married couple. Yay! 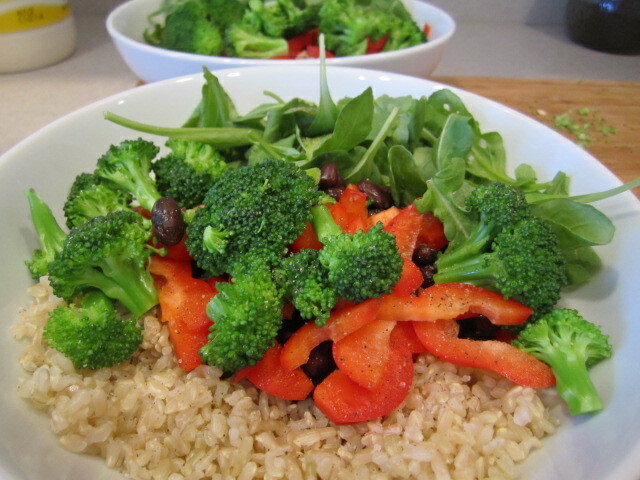 NOTE: check out the Recipes page to see what I did with the left over wild rice – super yummy! Clean and pat dry the Sole filets. Heat pan with butter on medium heat. Add s&p to the dredging flour, and cover the filets with flour, shaking off the excess. When the butter is just melted, add the filets to the pan, gently laying them away from you (to not get burned by any splattering butter!). 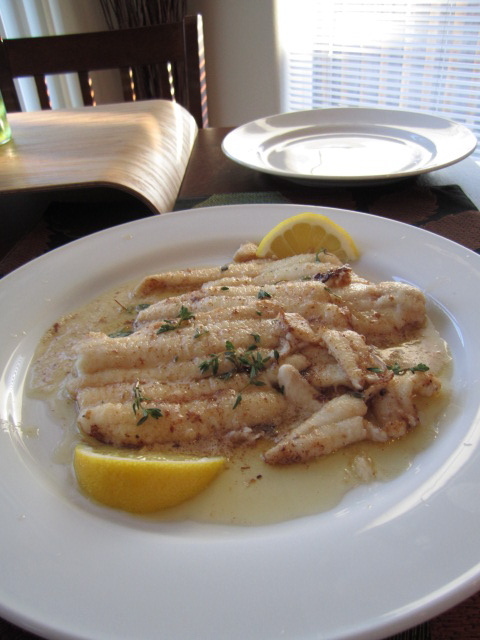 Cook – do not touch – filets for about 2 minutes, and using a fork, flip the fish. Squeeze in the lemon juice (stand back! ), and watch as the butter begins to brown. 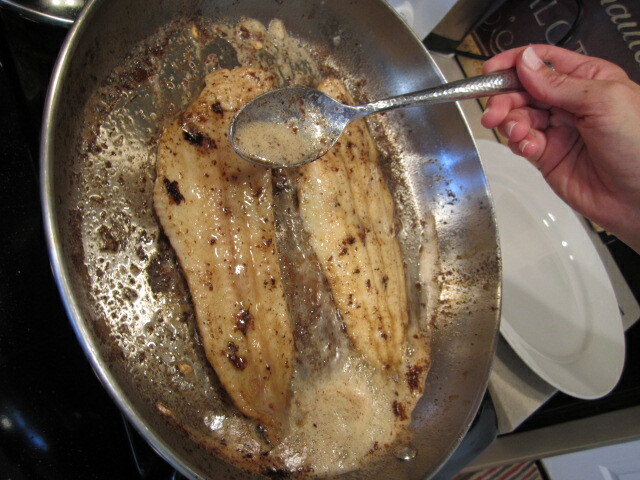 Here, you can pan baste; quickly spooning the pan sauce over the top of the fish (again, not moving the fish). Cook for another 2-3 minutes. 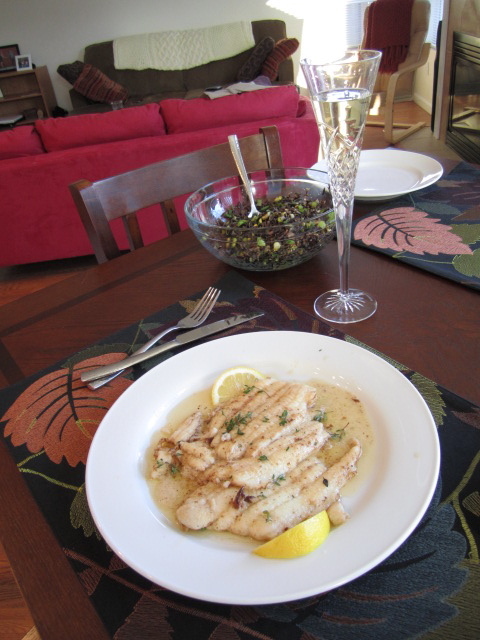 Using a fish spatula, transfer to a plate and cover with the sauce. Serve immediately with lemon slices and garnish of fresh thyme leaves. 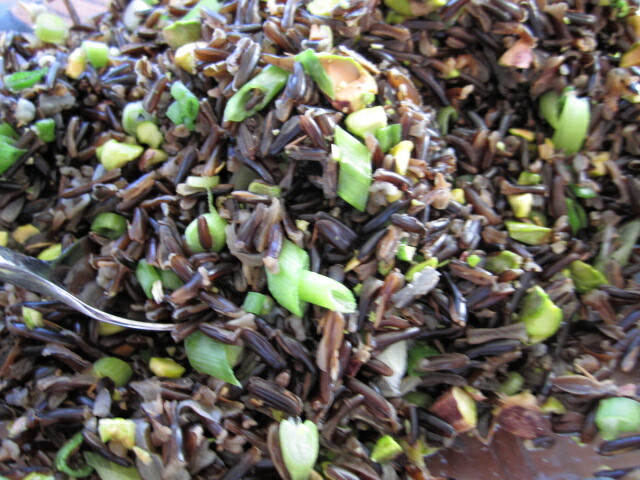 1 c wild rice, rinsed and drained. Heat the liquid in a large pot, and when boiling, add some salt, and the wild rice. Cover, bring to a boil, and then reduce to a simmer. Let sit simmering for about 45 minutes, or until desired tenderness. Drain, and transfer to a bowl. Add the pistachios, scallions, and s&p to taste. 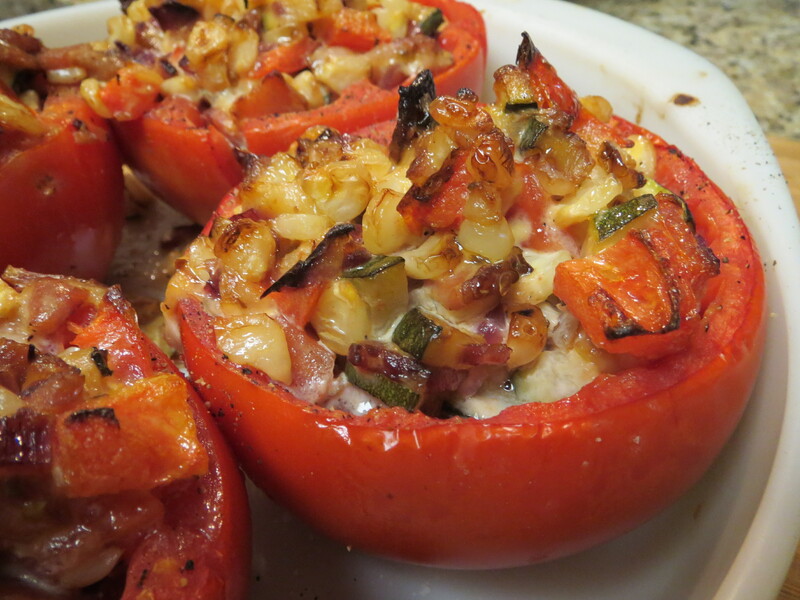 Serve warm, room temperature, or cold!